In 525 B.C., the Persian king Cambyses sent fifty thousand soldiers across the conquered Egyptian desert to take an oasis city not far from where the Libyan border stands today. According to Greek history, a hurricane-force sandstorm struck near the end of their six-hundred-mile trek. The army -- all fifty thousand men -- vanished without a single trace. Fast forward to 1986. A British archaeological team, sent to the edge of the Great Sand Sea to exhume evidence of the incident, has also gone missing. 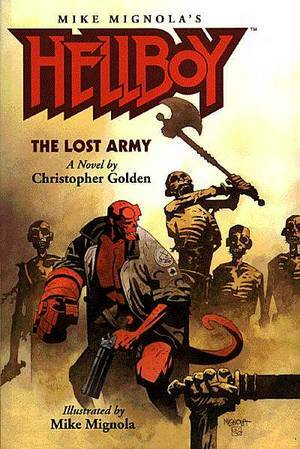 So the Bureau for Paranormal Research and Defense is sending the world's greatest paranormal investigator, Hellboy, to find the missing Brits and to discover what became of The Lost Army. Dark Horse is proud to present a milestone in the history of Hellboy. This illustrated novel is written by Christopher Golden, best-selling author of the book Of Saints and Shadows. Hellboy creator Mike Mignola has done sixty-eight black-and-white illustrations for the story, and those illustrations alone are worth the price of admission.